Waverley Root in 'Food' tells of the Roman belief that eating a lemon is the antidote for all poisons. This was reinforced by the story of two criminals who were said to have been thrown to venomous snakes but the one criminal who had eaten a lemon beforehand survived the snake bites. This story doesn't seem that far fetched when you think about the fact that although the existence of Vitamin C in lemons was not discovered until 1928 by a Hungarian Scientist, its medicinal powers have been used for centuries. Known by the 16th century to be a cure for scurvy, Portuguese sailors would stop and plant lemon and orange seeds on distant shores during their sea voyages. Women have used the lemon for centuries to help relieve colds, sore throats, asthma, rheumatism, upset stomachs, sweeten breath and whiten teeth. It was even used by the ladies of Louis XIV's court to redden their lips. Lemons are a member of the citrus family (citrus limon) and is an oval or oblong-shaped bright yellow fruit ranging in size from 2 to 3 inches (5 to 8 cm) with a bulge at the blossom end. The lemon consists of a yellow outer rind (skin) that contains the fruit's oils and perfumes. This outer rind, of varying thickness and graininess, can have either a bumpy or smooth glossy texture that contains most of the lemon's wonderful tangy flavor. This rind (zest) can be removed using a knife, vegetable peeler, grater or zester depending on its use. The zest can be used in desserts for its flavor as well as for garnishing. Inside the outer rind is a white membrane (pith) that is very bitter and should not be used as it is inedible. Small vessels called 'pulp vesicles' make up the inside of the lemon and contain the pleasantly acidic lemon juice and seeds. Squeezing the lemon by hand or with a lemon squeezer or reamer releases the clear tart juice that is used in both sweet and savory dishes. It's acidity can: act as a flavor enhancer; a little juice sprinkled over cut raw fruit (apples, pears, peaches, bananas, etc) prevents browning; added to boiling water it can brighten the color of broccoli, green beans or cauliflower; removes berry stains and garlic odors, mixed with a little salt makes an ideal cleaner of copper; and contains potassium and vitamin C.
When choosing lemons look for ones that are fragrant with brightly colored oily yellow skin. They should be firm, plump, and heavy for their size. Avoid lemons that have blemishes, soft spots, green spots, or are hard and wrinkled. If removing the outer rind (zest) make sure you wash the lemon thoroughly (soap and water is best) as some commercially sold lemons are sprayed with insecticide. If possible, buy organic lemons when using the outer rind. Some are also sprayed with a color dye and an edible wax to slow the loss of moisture. 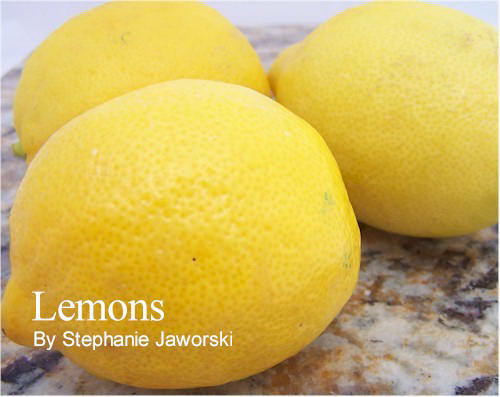 Lemons can be stored at room temperature up to a week or in a plastic bag in the refrigerator for several weeks. Although you can buy bottled lemon juice this is artificial tasting and a poor substitute for the real thing. The commercially grown lemons found in most grocery stores in North America are either the Eureka or Lisbon. Although the different varieties are distinguished by size, shape, and thickness of skin they are not usually labeled because the quality is pretty consistent. A relatively new hybrid is the Meyer lemon, prized by bakers, but primarily available in California. Said to be a cross between the lemon and orange, it can be identified by its round yellow-orange color. It is less acidic than other lemons and has a sweeter taste. Whether the lemon originated in Southeast Asia or the Middle East is debatable, but it is now grown in tropical and temperate climates throughout the world. Although available year round in most places, the quality and cost of commercially sold lemons is best in the winter months (in North America). Lemon zest is the most aromatic and flavorful when first removed, so use immediately. Lemon juice may be stored in a covered container in the refrigerator for a few days or else frozen in ice cube trays for future use. Thin, smooth skinned lemons at room temperature yield the most juice. To extract the most juice first roll the lemon on a flat surface, exerting light pressure. This squashes the membranes. Thick, bumpy textured cold lemons give the maximum amount of zest. Lemon zest, depending on its use, comes in many forms: long wide strips, julienne, or finely grated. Use a potato peeler for strips, a zester for julienne, and a grater for finely grated zest. When removing the outer rind (zest) do not remove the white pith, which is very bitter and inedible. LEMON ZEST - The yellow outer rind of the lemon that contains the fruit's flavor and perfume. CITRUS RIND - The outer skin of the lemon consists of both the yellow zest and white membrane (pith). CITRUS ZESTER - A hand-held utensil with 5 tiny sharp stainless steel holes used to remove the yellow outer rind of the lemon. Pull the utensil towards you over the surface of the lemon. The stripper digs into the skin removing only the yellow part of the rind forming perfect thread-like strips. CITRUS STRIPPER OR SHREDDER - A hand-held utensil with a sharp stainless steel notched edge used to remove the outer yellow rind of the lemon into 1/4 inch (.6 cm) wide strips. The length of the strips can be short or long depending on whether the lemon is stripped from top to bottom or around the middle. Pull the zester towards you over the surface of the fruit. Box-Shaped - A multi-purpose, four-sided free-standing stainless steel grater that has different sized sharp cutting holes with raised edges. The holes range in size from tiny to large that produce threads or strings of different fineness and size. Microplane Citrus Grater or Rasp - A relatively new stainless steel hand held grater originally designed as a woodworking tool. The tiny sharp-holed utensil can either be hand held or be a foot long rasp similar to the woodworking tool. Wood Hand-Held Reamer - A six-inch (15 cm) long ridged tear-drop shaped utensil that won't absorb juices or odors. Press the reamer firmly into a lemon half and twist to remove the juice. The sharp pointed edge can be used to remove the seeds. Reamer with Saucer - A ridged reamer centered in an attached spouted saucer made of glass, plastic or metal. When the lemon half is pressed down on the reamer, the juice collects in the saucer.